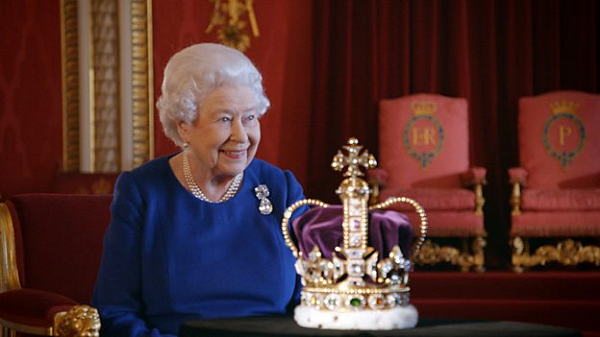 The BBC has offered details today about The Coronation, a new hour-long documentary about the 1953 coronation and the crown jewels, and the star of the show is none other than the Queen herself. Also included: a rare appearance by St. Edward's Crown, which is almost never taken out of the Tower of London. "As part of the film, to mark the 65th anniversary of Her Majesty The Queen's Coronation, The Queen shares memories of the ceremony as well as that of her father, King George VI, in 1937. The Crown Jewels, which form part of the Royal Collection, consist of 140 items and contain 23,000 precious stones. These sacred objects form the most complete collection of royal regalia in the world," the network announced in a press release. The film, which includes both private and official footage, includes rare interviews with the Queen herself. "I've seen one Coronation, and been the recipient in the other, which is pretty remarkable," she notes in the program. Alastair Bruce also contributes to the film. The film is part of a year-long collaboration between BBC television and radio and the Royal Collection. Two more films, including one on the collections of King Charles I, are forthcoming in 2018. More on the Royal Collection Season can be found here. According to the press release, "The Coronation is made by BAFTA and Emmy Award-winning Atlantic Productions. It is a co-production with Smithsonian Channel and ABC Television and distributed by FremantleMedia International. In a global event, it will be broadcast across the United States and Australia by its broadcast partners." The documentary will air on the Smithsonian Channel in the United States on January 14 at 8 PM eastern time. In the UK, the program will air on BBC One on the same date at 8 PM local time. In Australia, you'll be able to see the film on ABC on February 4 at 7:40 PM local time.